Qatar MotoGP, Losail - Warm-up Results Mar-23-14. Blue = Factory - Control ECU hardware, unique manufacturer software. 20 litres of race fuel, 5 engine changes for the season. All engines identical throughout the year within the same team (development freeze). White = Factory (with concessions) - Control ECU hardware, unique manufacturer software. Currently only Ducati, but technically applicable to any Factory manufacturer that has not achieved a dry win the previous year, or any new MotoGP manufacturer. 24 litres of race fuel, 12 engine changes for the season. No engine development freeze, plus the same softer rear tyre allocation and extra testing opportunities as the Open category. 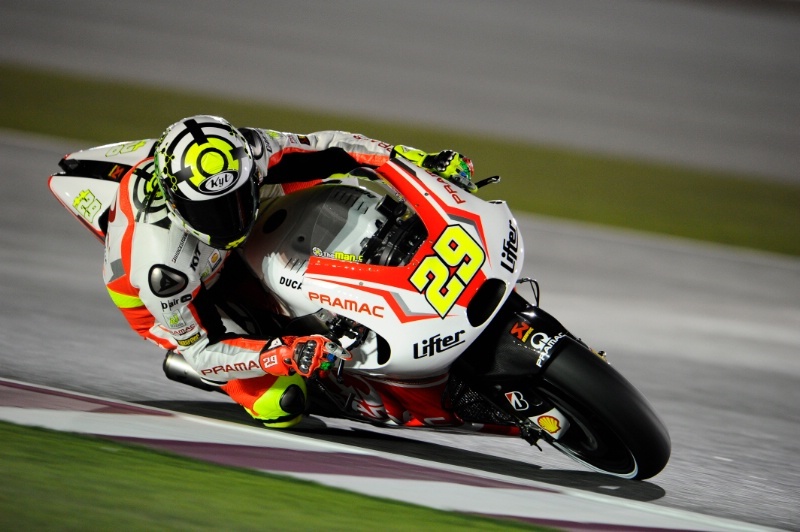 Fuel to be reduced to 22 litres should Ducati achieve a race win, two second places or three (dry) podiums during 2014. If Ducati claims three wins this season they will also lose the softer rear tyre. All other concessions confirmed until start of single ECU era in 2016. Red = Open - Full control ECU system, hardware and software. 24 litres of race fuel, 12 engine changes for the season. No engine development freeze, a softer rear tyre allocation and more testing opportunities relative to the Factory option.